The Angel 34 Foundation…is a cause for HOPE and an INSPIRATION by FAITH for every child to have their own ANGEL during their time of need” –Nicole Sheriff, founder, Angel 34. Nicole Sheriff was diagnosed with metastatic Ewing’s Sarcoma (bone cancer) in 2002 at age 13. Since then, she hasn’t stopped making a difference in the fight against childhood cancer. 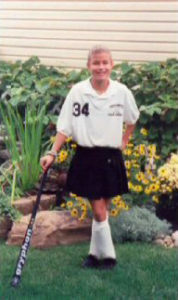 An ideal role model, Nicole never asked, “Why me,?” but instead embraced her new health situation as she would have any other challenge in the sports she loved – field hockey and basketball. Doug Sheriff, Nicole’s father and president of Angel 34, the nonprofit organization Nicole founded, tells us that her confident outlook on life helped her to mature quickly. During hospitalizations to treat her rare form of bone cancer, Nicole never missed a homework assignment. During stem-cell transplants she completed assignments with a bucket by her side. Driven, even through dreadful side effects, she did not have a grade below a B and even made the honor roll. Linda Sheriff, Nicole’s mother, tells us that Nicole’s ability to keep up with her schoolwork while maintaining her grades allowed her to run for and win the position of vice president of her class. While battling cancer, Nicole preferred to think about other children and their needs. “Mom, why did that girl next door die without her parents being with her?” Her parents had to explain the huge financial burden such a disease can place upon a family and how some parents aren’t financially able to spend last moments with their children without finding themselves unemployed. It’s hard to listen to the Sheriff family story and not want to do something for grieving parents who struggle as their children battle cancer. Karen and Rick Sampson, owners of Missing Piece, a country gift shop in Nazareth, have taken it upon themselves to be sure that everyone who comes into their shop is aware of Angel 34. Each season they host an event to support the foundation. At a recent event, Mothers for the Cure, Karen’s seven-year-old granddaughter, Paige (having the same birth date as Nicole) passed out a basket of sweet pea seeds because that was Doug Sheriff’s nickname for his daughter. Karen and Rick (who is an Angel 34 board member) are inspired to help because they believe that what they are doing gives hope to many children and adults. The name, Angel 34, has enormous meaning to a little girl who was an earth-angel to many. When Nicole was a child, she knew her dad was a fan of Walter Payton of the Chicago bears. She, too, became a fan upon seeing highlights of his professional accomplishments and learning of the charity work he had done for children. She agreed with Payton’s notion that scoring points is best accomplished through a team effort. She chose Payton’s number, 34, as hers for field hockey and basketball. Since then, the number 34 seems to appear nearly everywhere: The Children’s Hospital of Philadelphia, where Nicole was diagnosed with Ewing’s Sarcoma, is situated on 34th Street, Philadelphia. While there, she was assigned to room number 34. At the hospital, Nicole watched the Phillies vs. Braves game to find the pitcher on the mound was number 34. 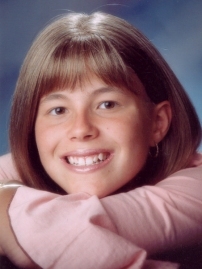 With countless additional examples of how the number 34 presented itself in their lives, Nicole always explained, “I’m telling you, my angel is always watching me and pulling my number!” Nicole Sheriff passed away at age 15 on May 3, 2004. Angel 34 calendars are available at Missing Piece, 462 Bushkill Center Road, Nazareth, PA 18064 or by calling 610-759-4033. Donations to Angel 34 can be made via their website: www.Angel34.org or by calling Doug Sheriff at 610-533-1923. Faith Brenneisen has more than 15 years’ experience working in nonprofit organizations and is passionate about making a difference both personally and professionally.